empower people to become agents of change in their organizations and communities, thus changing institutions from the inside out. engage in “field building” by fostering a broad, inclusive cultural conversation about the importance of compassion, connection, gratitude, and meaning, while bringing a trusted, science-based voice to the public. more than 150 educators attended our Summer Institute for Educators, and more than 850 have attended since 2013. ... and nearly 60 percent of them report extending those benefits to their students. 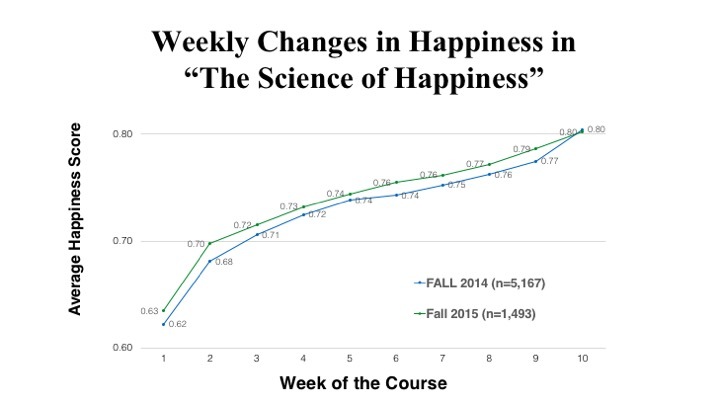 and when we survey students’ close friends, they say the students seem more happy, content, optimistic, and calm, and less stressed, irritable, and self-critical, from before to after the course—and these changes, too, persist for at least three to four months. Even these numbers don’t fully capture our cultural impact. Our work is recognized and applied in many different ways, some of them surprising. Our co-founder and faculty director Dacher Keltner was deeply involved in shaping the award-winning Pixar film Inside Out. Keltner and the GGSC’s science director, Emiliana Simon-Thomas, helped Facebook create more positive and compassionate interactions between their users. Our education director, Vicki Zakrzewski, has advised school systems around the world—including in China, India, the United Arab Emirates, Thailand, and Belgium—on how to foster kindness and emotional well-being among their students. Our reach and impact are extended further by the many media outlets that have featured our work, including the New York Times, NPR, The Wall Street Journal, CNN.com, The San Francisco Chronicle, Scientific American, and many television news programs. Media produced by the GGSC have won the Society of Professional Journalists Excellence in Journalism Award, a Gold Medal at the 2016 International Radio Festival, the Social Psychology Network Action Teaching Award, and the Council on Contemporary Families Award for Outstanding Online Coverage of Family Issues. Our Science of Happiness podcast was a finalist for the Jackson Hole Science Media Awards in the Best Audio Program category; our magazine has been a finalist for the prestigious Maggie Award and was nominated multiple times for Independent Press awards. Members of our staff have also gathered many individual awards for their work. UC Berkeley has recognized Dacher Keltner for his teaching and bestowed the Chancellor’s Outstanding Staff Award on Emiliana Simon-Thomas for her work on our Science of Happiness course. Our magazine editor Jeremy Adam Smith has won numerous awards for his journalism from the Society of Professional Journalists, the Education Writers Association, and the California Teachers Association, among others. We achieve this impact with the help of more than 1,500 supporting members and donors. Please consider supporting our mission and programs!